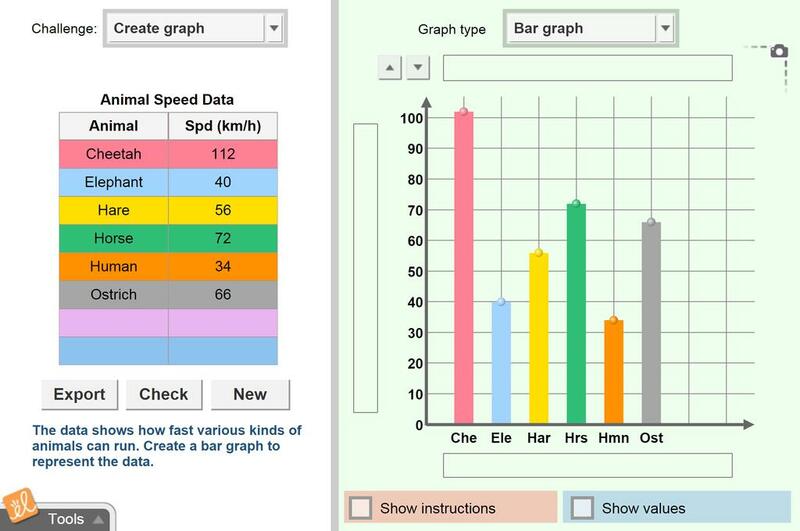 Create a graph (bar graph, line graph, pie chart, or scatter plot) based on a given data set. Title the graph, label the axes, and choose a scale. Adjust the graph to fit the data, and then check your accuracy. The Gizmo can also be used to create a data table based on a given graph. Identify bar graphs, line graphs, pie charts and scatter plots. Explain how each type of graph is used. Learn to title and label graphs properly. Choose the optimal scale for graph axes. Plot bars, points, or regions accurately on a graph. Interpret what is shown on a graph. An interactive lesson to analyze, interpret, and create graphs and tables in the Science and Math classro... (more)om. This also supports a paperless classroom. Edits are welcomed! State of Florida - MAFS Florida Standards Assessment - Gizmo Resource for Grade 3. Contains sample questi... (more)on stems, various response mechanism types, and Gizmo suggestions for teacher and student use. Vocabulary and instructions have been modified to increase student understanding for students performing ... (more)below grade level or requiring extra support in reading and math. I use this W.S. as a culminating activity after discussing the scientific method, experimental variables ... (more)and having the students work through the Graphing SKills GIZMO. The W.S. can be easily modified to accomodate different learning levels. Beginners to competent graphers by using this Gizmo. Great review also for those who forgot. Excellent TEI Simulation as well as questions. Excellent "Hands On" lesson to teach authentic material. This is the best graphing activity for my students! This Gizmo is great for all subject areas. Students often need a review of graphing before beginning a science or geography class. Great review for students of all ages. Do this at the start of school and before big tests! Awesome practice for my kids! They stuggle so much with graphing! Great GIZMO! Creating graphs as well as reading them! Excellent Gizmo to help with all the core subjects! This is great for helping students learn which type of graph to use. This is a great review of graphing (especially right before testing)!